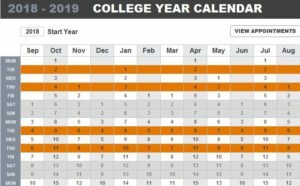 The free College Year Calendar is all that you need to plan you college semester for both inside and outside the classroom. Once you download this free Excel template, you can enter your own schedule items and place them in this simple calendar format. That’s it that all you need. Imagine, missing a class because you forgot the date of your dentist visit. That simply won’t do. This template takes away all the fear and anxiety of missing class or an exam by giving you a structured way to organize it all in one place. Get started today by reading the guide and downloading the sheet below. Get started on your academic success today! You can download the free template file to your computer by clicking the link we have provided below. Next, follow the set of instructions listed below. 1. Under the “yearly planner” sheet, enter the start year. You will need to indicate what year you’re currently in. You can select the date at the top of the page and the sheet will automatically adjust the dates. 2. Under the “appointments” sheet, enter your appointments/events in the table, they will be automatically populated in the “yearly planner” sheet. This data is actually what the template pulls from. You can enter anything from doctor visits to your exams for school. Whatever you enter in this sheet will automatically be applied to the main table on the other tab. 3. Will require macros to be activated, to activate macros: File > Options > Trust Center > Trust Center Settings > Macro Settings >Enable all macros (nor recommended….can run). To use this function, you will need to enable macros on your computer. To do this, just follow the simple set of instructions above. Now you have everything you need to start this semester off on the right foot.